After almost 8 months of tediously restarting, testing, scrapping all the previous rooms, and recording all the dreaded indexes of every item in the game five times each, my first real hack is finished. The difficulty isn't as bad as the name suggests. It's not quite as hard as the Cliffhanger HV, nor is it Golden Dawn-easy. It is not necessary to use IBJ, short charge, or DBJ at any point to complete the game. You will, however, need to use the quick charge technique, mid-air morph, some precise walljumping, and shinesparking skizzles. I'm not making any promises on the difficulty of 100%, though. :) In fact, I'll recognize anyone who is able to get more than 90%. Major thanks to DMantra for bughunting and putting up with some pretty bad crashes and bugs. 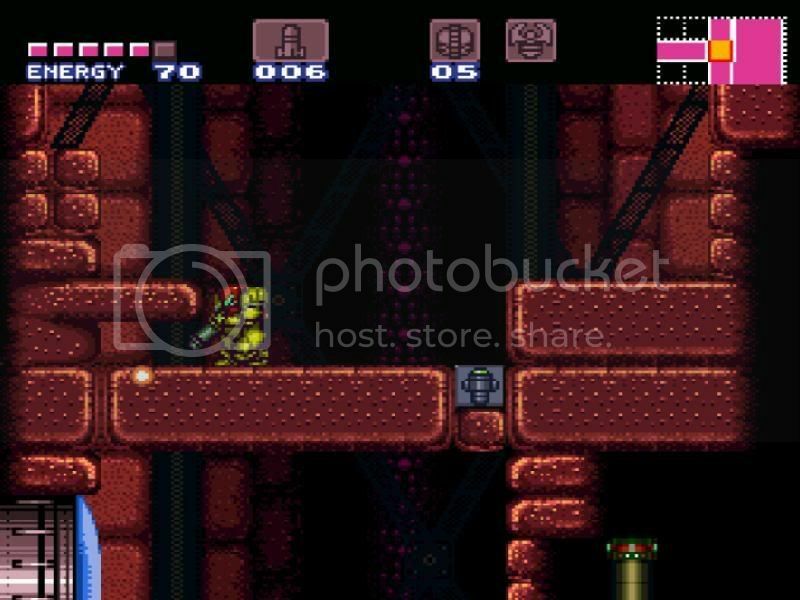 Without further ado, I present to you Super Metroid: Precision (unheadered)! The NEWEST easy version is now available! There is more leeway in your shinespark and walljump endeavors and all the bosses are weakened to crap. I believe nothing is hard other than exploration now. The hack should now be FULLY console-playable. Speedball is the hardest thing you need to know. First Post!! and Bug-hunting here I come :D. HAYYYYYY!!!!! YOU POSTED THE MOMENT I CLICKED ON THE POST BUTTON!!!!!!!! By the way, Sounds good. I'm having those issues with my hack, Super Metroid on Ac!d. Hmm. Too many spikes for my liking so far, but I like the look. Missing the morphball look; my ball just has a few pixels go glitchy during some parts of the roll animation. Enjoying the difficulty, though, as well as the INTEND logo. Always waiting for fullhacks, but this is really excellent for a halfhack. Ok, got the Missiles, MB, and Bombs, just entered Green Brinstar. Everything looks nice, harder difficulty in using the mid-air morph holy crap that tall brick wall. Anyways, just a critique so far. There is an area directly above your ship that without morph ball you can get semi-stuck due to the slanted ceiling. I did this on purpose but you can get out, but it takes a hot minute if you don't do it right.I know your emphasis is on mid-air morphs and wall-jumping. But spikes at the start, I had to use a couple save-states. At the bottom of the Vertical shaft with the lava and orange blobs.....I'd rather fix it so that there is a POSSIBLE way to get through that without doing a hit-and-run through there. I'd get hit, fall in the lava, and before I knew to react I was dead because lava takes your health fast as hell. Other than that, the tile set, layout, nothing easy, but not impossibly hard. I like it so far. I'll give another critique later. Ok, got the Missiles, MB, and Bombs, just entered Green Brinstar. Everything looks nice, harder difficulty in using the mid-air morph holy crap that tall brick wall. Anyways, just a critique so far. There is an area directly above your ship that without morph ball you can get semi-stuck due to the slanted ceiling. I did this on purpose but you can get out, but it takes a hot minute if you don't do it right.I know your emphasis is on mid-air morphs and wall-jumping. But spikes at the start, I had to use a couple save-states. At the bottom of the Vertical shaft with the lava and orange blobs.....I'd rather fix it so that there is a POSSIBLE way to get through that without doing a hit-and-run through there. I'd get hit, fall in the lava, and before I knew to react I was dead because lava takes your health fast as hell. Other than that, the tile set, layout, nothing easy, but not impossibly hard. I like it so far. I'll give another critique later. the mysterious tunnel in the ceiling? Hm, can't find a place to go after bombs. I've exhausted the right part of the landing site, the brick-filled room that leads to the Brinstar elevator, and the blue Brinstar elevator room (is there any point to [spoiler]the mysterious tunnel in the ceiling?[/spoiler]). I'm pretty sure your next destination is green brinstar. In the room to the left of the crateria mainstreet there is a bombable passage in the middle of the brick wall. The bombable blocks are distinguished from the rest by their looks. Trained by Cpadolf. Mission: To Perfect. First break goes to... dun dun dunn.. Spoofer! Lots of spike filled death. This looks like it's going to be a toughy, maybe too much so for a wimp like me. I played Cliffhanger on easy mode. So far I can't get through the spike course to get down into brinstar. Two hits to death just doesn't leave much room for mistakes. Lots of spike filled death. This looks like it's going to be a toughy, maybe too much so for a wimp like me. I played Cliffhanger on easy mode. So far I can't get through the spike course to get down into brinstar. Two hits to death just doesn't leave much room for mistakes. 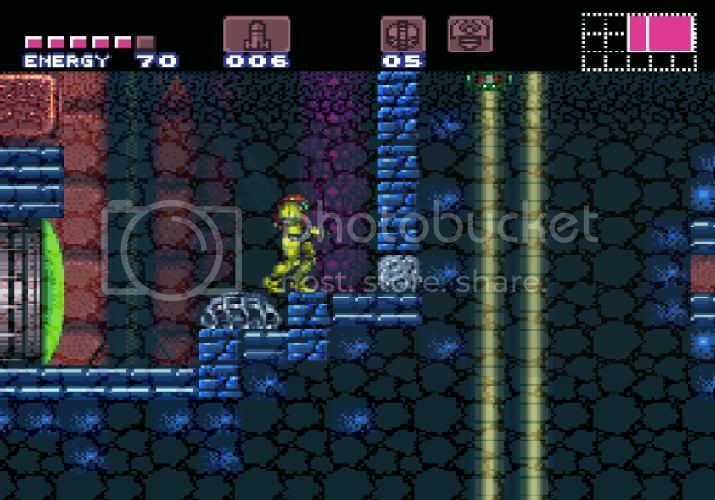 The spike pit is the only spike room that ever appears in the game. And the spike pit is rather easy to pass as soon as you do the second walljump to midair morph without damage. What no one seems to understand is that you get two tries: complete the first jump, which by no means is pixel perfect, and just jump down on the second pit into the spikes. You don't need health after that. [u]The spike pit is the only spike room that ever appears in the game. [/u] [spoiler]And the spike pit is rather easy to pass as soon as you do the second walljump to midair morph without damage. [/spoiler] What no one seems to understand is that you get two tries: complete the first jump, which by no means is pixel perfect, and just jump down on the second pit into the spikes. You don't need health after that. 2 issues with Kraid I noticed. 1. If you wall jump above the ceiling before Kraid goes to full form and jump, the screen won't scroll and you see yourself come up through the floor, nothing major. 2. Kraid's front claw that he opens and closes to protect his mouth frequently gets "stuck". His claw will go to either the open "guard" position or clenched fist position and just stay there, up to a minute or two in my case.....which is really annoying with no missiles and using on charged shots. .....jesus I hope this isn't another Hell's Run in here. In the room to the right of the LS, there's a bomb block on the far left in the top left corner. Go through there and in the next room is a huge room with a lot of bricks in it, which I assumed in the one you're talking about. If you wall-jump up the side of the bricks you'll see two holes in the bricks. You have to mid-air morph out of a wall jump to get into the gap to the right of the holes, then just bomb your way through. I just got the Charge and I don't know where to go in brinstar. I know SS is up through the hole in the big room, but I can't get up there without Ice. EDIT: wow there's a lot of repliesd since I was on here an hour ago. In the room to the right of the LS, there's a bomb block on the far left in the top left corner. Go through there and in the next room is a huge room with a lot of bricks in it, which I assumed in the one you're talking about. If you wall-jump up the side of the bricks you'll see two holes in the bricks. You have to mid-air morph out of a wall jump to get into the gap to the right of the holes, then just bomb your way through. But now I'm stuck... [spoiler]I just got the Charge and I don't know where to go in brinstar. I know SS is up through the hole in the big room, but I can't get up there without Ice. [/spoiler] I like the Smiley Ball... :laugh: EDIT: wow there's a lot of repliesd since I was on here an hour ago. You can get to SS without Ice, it takes a VERY "PRECISE" walljump. \I'm ready to give up for now I still can't figure out where to go....from what I can tell I need Super Missile next, but I have searched high, low, left, right, everywhere, but can't find a trace of anywhere where I can go next. Edit: Bolognab, please go through and check if any items may have been deleted during the process of your hack, because I am at a total losss.... and I never have trouble finding the right path in Metroid games....ever. I'm just hoping if you do have it right, that the path I need to take isn't completely oblivious with it's surroundings. It helps if every path stands out a bit. You can get to SS without Ice, it takes a VERY "PRECISE" walljump. \I'm ready to give up for now I still can't figure out where to go....from what I can tell I need Super Missile next, but I have searched high, low, left, right, everywhere, but can't find a trace of anywhere where I can go next. Edit: Bolognab, please go through and check if any items may have been deleted during the process of your hack, because I am at a total losss.... and I never have trouble finding the right path in Metroid games....ever. I'm just hoping if you do have it right, that the path I need to take isn't completely oblivious with it's surroundings. It helps if every path stands out a bit. there's a sb block above some pb blocks in the long dark brinstar shaft. Yeah I was up there but due to the lack of Super Missiles didn't find anythnig... Guess I'll have to look closer. I guess you were trying to prevent this from happening? Cuz I spent about an hour with slowdown using shinespark up the old red brinstar shaft. Had to lay a powerbomb too. it's exactly pixel perfect when arm "pumping". Ended up going down into the water. But without Super Missiles I can't go through the door and the elevator up to requires Super Missiles as well (or Speed Booster, but that won't happen). So I'm stuck in the water with no way out. Nvm, I'm sorry but I didn't want to start over, so I added 2 Crumble blocks with SMILE where I shot to get out and back where I was in old Red Brinstar. Where in hell did you find that many E-tanks? After the Supers in WS where am I supposed to go? I went to the right part of norfair but didn't find anything there except for a heated run that can't be done with the amount of E-tanks I have (I'm pretty sure about this at least, I have 3 BTW. I can't find more E-tanks, or varia suit, and I have nowhere else to go. I'm at the entrance to kraids lair but cant figure out how to get to the ledge so can i enter the lair! Also, the norfair elevator is covered with a grey door. help!